Whilst writing an essay is an important learning process, the opportunity for real progression comes when your marked work is returned to you. Don't be tempted to cower away from that infamous red ink; it is there to help you improve. Taking careful note of all feedback you receive about your essays will help you to get the most from each homework task. Take the time to really think about the points that your teacher has made. First, look at any corrections they may have made to your spelling, grammar and punctuation. Try to see if you are making any recurring mistakes. You might consistently misuse apostrophes, for example. This will help you to see what you need to focus on, read up on and ensure you put right in your future essays. 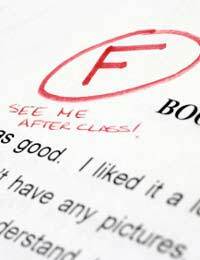 Secondly, look to see what your teacher has said about the content of your essay, the points you have made and your knowledge of the subject at hand. If your teacher has revealed certain areas where your understanding of the issues involved is shaky, motivate yourself to brush up your knowledge of these areas. Thirdly, look to see what they have said about the structure, style and persuasiveness of your essay. If your teacher has made any suggestions for improvement, take careful note of these. If you feel that your teacher has not provided you with feedback that is detailed enough, don't be afraid to speak to them and ask for further comments and suggestions. Let them know that you are keen to improve your essay style and they are sure to help you out. After looking at all the detailed feedback you have received, take a moment to take a mental step back and read through your essay afresh. Think about what you would do differently, if you were to write the essay again. You could even briefly sketch out an alternative essay plan in line with this. You might like to keep a separate notebook and list all the feedback you receive from your teacher, so that you can flick back through it each time you are set a new homework essay. Get into the habit of setting yourself goals for future essays, based on the feedback you have received. Your notebook will help you to keep track of this. As well as focusing on the feedback you have received from your teacher, consider asking a friend or family member to read through your essay. Ask them what their first impressions were upon reading your work. Then ask them which parts they feel are particularly strong and which aspects might require a little extra attention. Once your essay has been handed in, you might be tempted to breathe a sigh of relief and give no further thought to it. Be careful not to fall into this trap if you are set on improving your essay skills. Look carefully at all corrections and suggestions to ensure that all your hard work has not been in vain. Last but not least, remember to congratulate yourself on what you have done well!